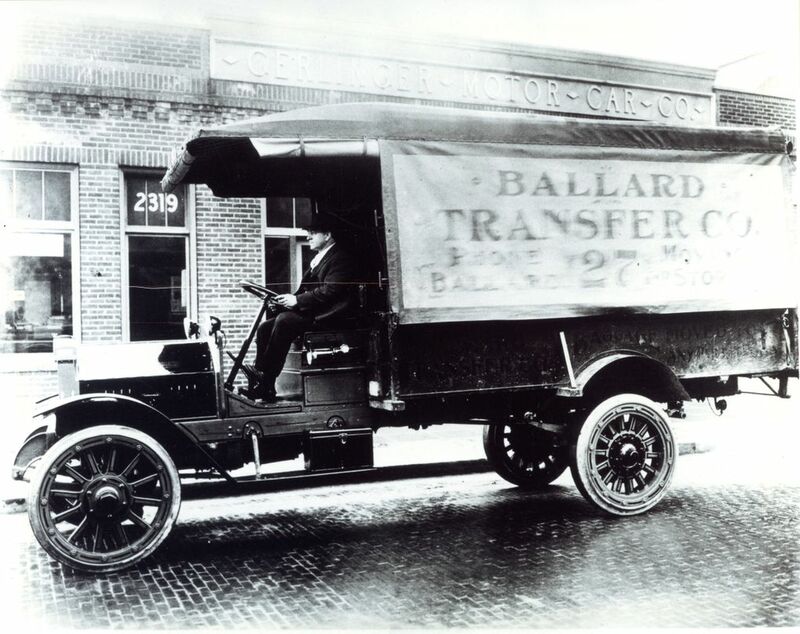 Founded in 1905 as a horse-drawn hauler of fuel, Ballard Transfer grew to become a mover of choice for the largest and most complicated objects — from MRIs and naval cannons to elephants. But unable to find a new generation of movers, the family-owned company hoisted its last load the Friday before Christmas. 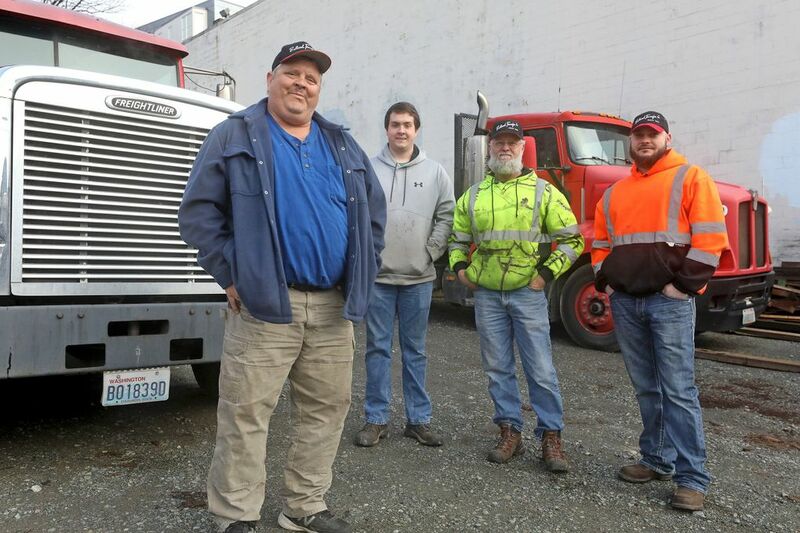 On December 21, the Ballard Transfer Co. closed out 113 years in business in much the same way as it began — hoisting a cargo too heavy and difficult and just plain ornery for nearly anyone else to handle. Its final job — lifting a 6-ton, ultra-delicate magnetic resonance imager, or MRI, up the outside of Harborview Medical Center and then inching it through a huge hole cut into the second-floor wall — was a fairly typical errand for the crew at Ballard Transfer. But it was a fitting finish for a company that, from its huge warehouse near the Ballard waterfront, has helped haul Seattle through every phase of its modern economic history. Founded in 1905, in the booming aftermath of the Klondike Gold Rush, the multi-generation company toted everything from settlers’ trunks, old-growth beams, fishing trawlers and Craftsman bungalows to cyclotrons for scientific research and electric transformers for Amazon towers. The jobs have rarely been predictable — past cargoes include Fremont’s Lenin statue, an entire small town out by Neah Bay and a live elephant. The work was seldom routine. A typical day might find the company’s riggers, drivers and forklift operators “moving a piano in the afternoon after you’d got done moving greasy machinery in the morning,” said 58-year-old Dave Miller, the sixth and final Miller to run the company, as he cleaned out the office on New Year’s Eve. Yet it was precisely Ballard Transfer’s success as a sort of jack-of-all-trades generalist that ultimately made the company so hard to sustain in today’s specialist-dominated economy. Last year, the Miller family sold the property to a developer who plans a six-story apartment with street-level retail and views of Salmon Bay. the sale follows a long, unsuccessful effort to find someone in the next Miller generation with enough varied skills — and enough entrepreneurial brass — to step in as boss. “No one was really in line,” Miller said. It’s the end of a quintessential Seattle enterprise — one that has closely followed nearly every twist in the city’s economic story. The original company — Ballard Livery & Transfer, on Leary Way — was one of numerous firms that arose to serve the flood of immigrants — and their cargoes — pouring into Seattle after the 1897 Alaskan gold strike. By the 1920s, owner A.J. Boyd was running one of the area’s largest moving companies, with 10 horse-drawn wagons and two daily runs between Ballard and Seattle. In 1930, the company was purchased by Dave Miller’s grandfather, Scott Miller, himself a Seattle newcomer, looking to expand his own moving company, Fremont Transfer. These were uncertain times for the cargo business. The Great Depression and subsequent labor strife wiped out much of Seattle’s freight business. But in what became a trademark move, Miller survived by pushing into new and increasingly complicated niches. The company, now fully mechanized and known simply as Ballard Transfer Co., hauled fishing gear from boats wintering at Fisherman’s Terminal. Its crews muscled lathes, mills and other heavy machinery for the city’s multiplying factories. “Change with the times or you won’t be in business for long,” Scott Miller told his twin sons, Roger and Rodney, Dave’s father and uncle, who by age 12 were both helping unload company trucks, according to a 2005 profile of the company in The Ballard News Tribune. No job was too difficult. In the company’s cluttered archives are faded photographs of improbable cargoes — 100-footlong timbers, industrial machines, entire fishing vessels — lashed precariously to the back of some sagging flatbed. That adaptive, figure-it-out-as-you-go business model was reflected in one of the Millers’ first jobs, back in 1930: transferring Tusko, reportedly the world’s largest captive elephant, from the rail yards to Playland, an amusement park located on the south shore of Bitter Lake. As Seattle and the Northwest boomed again in World War II and postwar period, Ballard Transfer found new lines of business. Lumber for new suburban tracts. Steel rebar for the new dams on the Snake and Columbia rivers. When Interstate 5 tore through town, starting in the late 1950s, Ballard Transfer joined in a new gold rush: moving the thousands of houses that stood in the freeway right of way. The method was equal parts skill, muscle and nerve: Crews would run a steel beam under each end of the house, then jack the beams, by hand, high enough to slide wheeled dollies under each corner. The dollies were then hitched to a semi and towed, very slowly, to locations across the Puget Sound region, often blocking roads for hours at a time. “They weren’t regulated quite as much then,” Miller said. “Like, not at all,” joked John Middleton, 62, who has worked for Miller for 18 years. 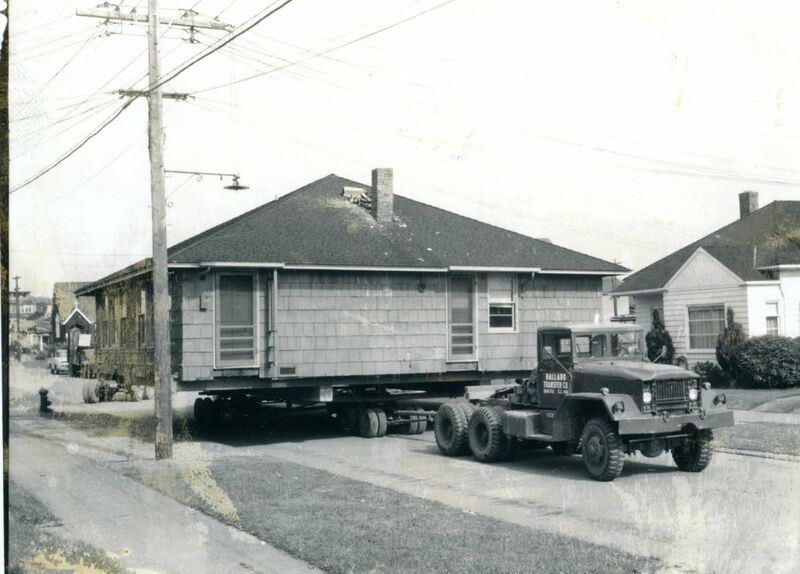 When increasing congestion made house moving too expensive, in the 1960s, the changing Northwest economy brought still more opportunities for Ballard Transfer, which by then was being run by Dave’s uncle, Rodney. The company contracted with Allied Van Lines to move in new hires for Boeing’s growing army of engineers and machinists. In the 1970s, a boom in the fishing fleet kept the company busy hauling deck cranes and nets. In the 1980s, as digital technologies began to proliferate, Ballard Transfer moved the first of more than a hundred MRIs — heavy, expensive, delicate machines that required extreme care. “There were a few things you could do to one of those machines that would put you out of business,” Miller joked. By the early 2000s, Ballard’s cargoes reflected a city growing more high-tech — and more high-end. Fermenting vats for the growing fleet of microbreweries, starting with Redhook. Lab equipment for new biotech firms. Five-ton City Light transformers for apartment and office towers, including many of the tech-company buildings in South Lake Union. But recent jobs have also pointed to the economic disruption caused by those same tech companies. Many of the printing presses Ballard Transfer has hauled into Seattle over the last century are now being hauled back out and shipped to customers in Mexico or South America. Ultimately, Ballard Transfer itself was caught out by economic disruption. One such disruption was the city’s red-hot real estate market. The Millers got two dozen offers for the two-third acre property, which ultimately sold for $11.75 million, Miller said. The other disruption was generational. Since Dave’s grandfather bought the company, management has moved through the family like clockwork — from his uncle to his father to two of his elder brothers and, in 2010, to Dave himself. Miller is standing near the cavernous company warehouse, which is filled with artifacts from decades in the moving business. Just outside is a huge forklift, the “Ballard Transfer” logo already painted over. Inside are neat piles of chains. Floor rollers for setting under cargoes. A set of antiquated hand-operated house jacks, each capable of lifting 15 tons. The objects speak to the complexity, the effort, and frequently the risk that made this company such a bear to run. Several times, talk turns to the accidents, like the driver they lost to a shifting load of steel and, conversely to the miracle that everyone here “still has all of these,” says Miller, holding up his hands and wriggling his fingers and thumbs. But those same challenges also highlight what, for a certain entrepreneurial personality that once marked this city, made the job so rewarding for so many decades.